Two treks. 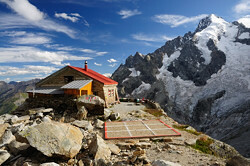 First from La Fouly via Cabane de l'A Neuve, Cabane de Saleina, Bivouac de l'Envers des Dorées and Trient glacier to Aiguille du Tour (3540m) and down to Praz de Fort. Afterwards from Arolla to Cabane de Bertol, Tête Blanche, Refuge des Bouquetins, Cabane des Vignettes, Pigne d'Arolla (3796m), Cabane des Dix and after an attempt to climb Mont Blanc de Cheilon back to Arolla. Finally four pictures from the drive home. We decided not to underestimate the glaciers and to learn the basics of the necessary skills at a specialized course. We spent most of our time practicing crevasse rescue above Adamekhütte but we also found the time to climb Dachstein.